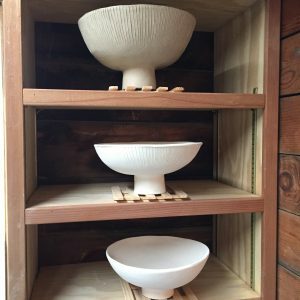 Here are the preliminary results of my quest to make symmetrical pedestal bowls using a slump mold. They progressively grew in size and stature, with the bottom-most being comparatively big, middle bowl being bigger, and top-most being the biggest and tallest. So far, the process has involved cutting large slabs into large circles, and pressing them into a plastic-wrapped mold, and gently beating the clay into submission. Then, the insides required seemingly endless smoothing, and much effort was required to make the lip even from all angles. The drying process was arduous, gradually getting the clay to the point where the bowls would maintain their shape so that I could flip them upside down onto a slightly smaller mold. While the bowls were propped up from the inside, I was able to smooth the outsides and attach a pedestal.